More household wealth in America sounds like good news, but it could also mean economic trouble. 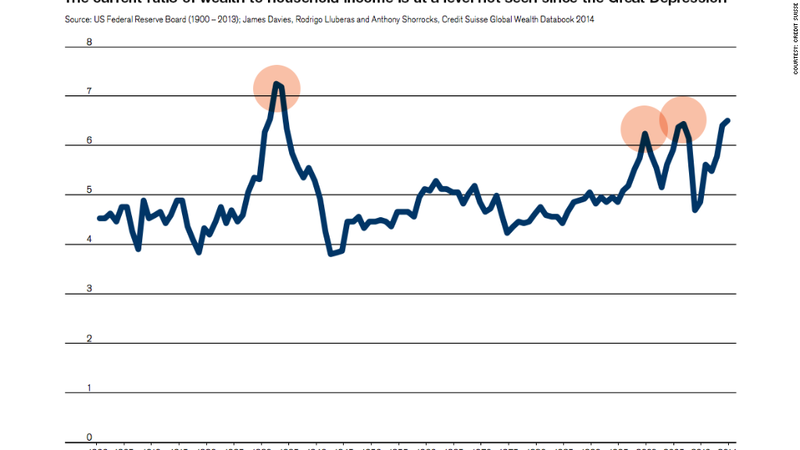 The ratio of wealth to income has hit a recent record, according to Credit Suisse. The last time it was this high was during the Great Depression. And it came close two other times: 1999, the year before the dotcom bubble burst, and leading up to 2007, before the housing market crash. Wealth has skyrocketed, driven mainly by the soaring stock market, and that has mostly benefited the rich. Income for the average person, meanwhile, hasn't been growing much. Credit Suisse analysts found that the ratio of wealth to income is 6.5. For more than 100 years, it has typically fallen between 4 and 5. "This is a worrying signal given that abnormally high wealth income ratios have always signaled recession in the past," the Credit Suisse report said. Wealth per adult in the U.S. has risen every year since 2008. In fact, average wealth is now 19% above the pre-crisis peak hit in 2006, the report stated. And $31.5 trillion household wealth has been added to the U.S. since 2008. While experts said it's normal for wealth to outpace income, especially after a recession, it becomes a problem when it rises so fast that people feel overly optimistic about their wealth. Tim Yeager, chair of the Arkansas Bankers Association, said when wealth inequality increases, the likelihood of asset bubbles also rises. "Stock market and financial industry wealth are always moving around looking for the highest returns and makes bubbles more likely," he said. "When the stock market gets hot, more people pour in and that amplifies the creation of a pending bubble." Russell Price, senior economist at Ameriprise, is hopeful the income side of the equation will balance out soon. "The pockets of slack in the labor market are evaporating and job growth is very encouraging - both are needed to increase wages." The fact that there's been three periods of high wealth to income ratios in 15 years has Yeager concerned. "These asset bubbles are becoming more frequent and that causes financial instability." Federal Reserve Chair Janet Yellen said in a speech Friday the increasing inequality could dampen the economy. "It is no secret that the past few decades of widening inequality can be summed up as significant income and wealth gains for those at the very top and stagnant living standards for the majority," she said.